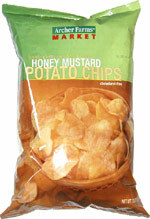 Taste test: These are kettle-style chips that have a good balance between the honey (sweet) and the mustard (spicy). With many honey mustard chips, we've discovered that usually the mustard overpowers the honey, but it isn't the case with these. 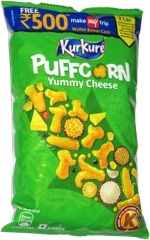 They have a good crunch, and don't leave too much residue on your fingers, and the taste is powerful enough to let you know that this is a flavored chip. Plus, the mustard leaves a bit of a spicy aftertaste when you've finished eating them, always a plus. But not spicy enough where you need to reach for a glass of water. Smell test: A slight mustardy aroma wafts from the depths of the bag upward.